Extremly Rare pin, ONLY 100 pieces were made and numbered on the back of each pin. The pin was given to Staff people only. The pin is Brand new. It will be sent in a wrapped bubble envelope. 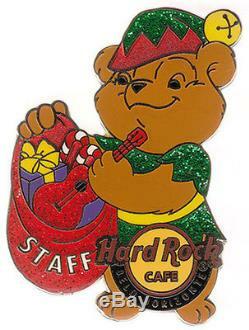 The item "Hard Rock Cafe BELO HORIZONTE Xmas Bear STAFF pin" is in sale since Monday, August 28, 2017. This item is in the category "Entertainment Memorabilia\Music Memorabilia\Rock & Pop\Artists H\Hard Rock Café\Pins". The seller is "franky4475" and is located in Boston, Massachusetts. This item can be shipped worldwide.